Hydrochloric Acid (vital for food breakdown) declines with age. This amino acid can be a game changer, even lifesaver for some digestive issues. Also, it potentially benefits our heart, defines body composition, muscle gain and fat-loss, promoting protein synthesis in the body. 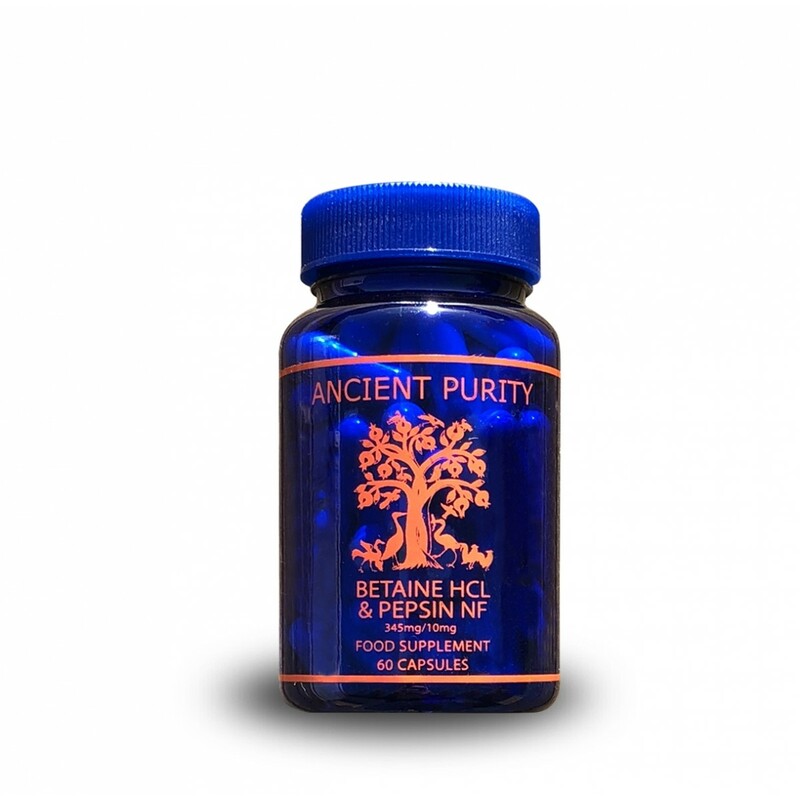 Betaine HCL with Pepsin NF sterilises ingested food, acidifies it and hence activates a powerful protease called Pepsin and allows vitamin B12 to be extracted from foodstuffs. 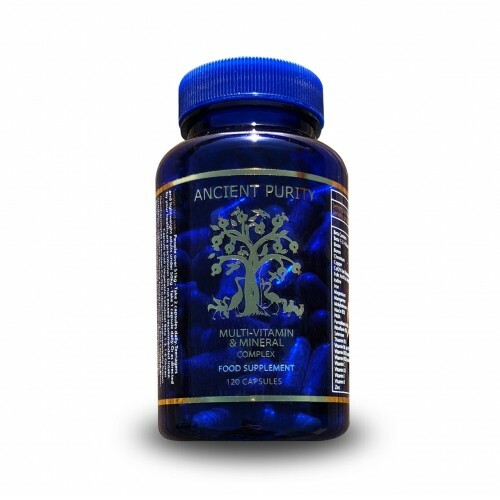 Additionally, several minerals such as iron, calcium and zinc rely on this acid for their utilisation in the body. It will help to replace some of the lost acidity in the stomach, thus aiding the digestion of food. This supplement may also be favoured by those who wish to ensure a sufficiency of Hydrochloric Acid. 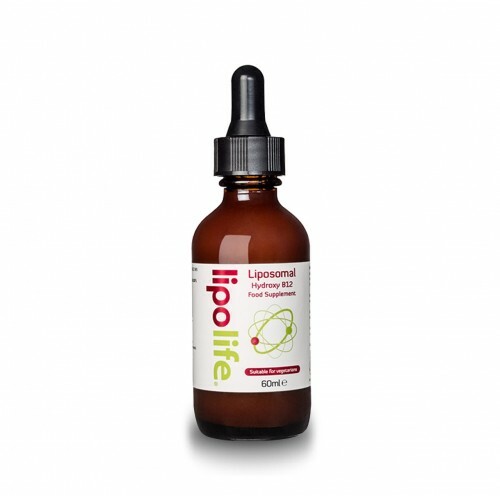 Each capsule provides Betaine HCL 345mg and Pepsin NF 10mg Betaine is essential for the process by which dietary lipids are turned into phospholipids, and so supports liver function. Stomach acid is a key component of our immune system needed to kill off any potential pathogenic bugs in our food. If the acid levels aren’t strong enough, besides not properly sterilizing our food, the stomach could delay emptying which can cause a multitude of digestive problems. If you have low stomach acid and don’t fix it, you will have subpar health forever. The first step is to replace the lost stomach acid until you figure out the root cause. One of the most common methods of supplementing for low stomach acid is using Betaine Hydrochloride (HCL). Betaine HCL increases the level of hydrochloric acid in the stomach necessary for proper digestion and assimilation of nutrients from food. Normal levels of hydrochloric acid are required for complete digestion of proteins and absorption of amino acids. It’s also required for the extraction of vitamin B12 from our food. Betaine HCL helps to restore the proper acid levels in the stomach and maintain healthy GI function. Many people are now switchin to the low or no carb diet, some people find they are burping a lot after meals, having a decent amount of gas and feeling bloated all the time. Often supplementing with Betaine HCL improved all of their digestive problems overnight. As an added bonus some found theyI lost up to 2 inches on thier stomach measurement due to the reduced bloating. It’s important to understand the risks of Betaine HCL supplementation. It’s generally safe for most people. However, in the book “Why Stomach Acid is Good For You,” Dr. Wright recommends doing so under the guidance of a physician. No, seriously… it’s a good idea to find someone qualified to watch over your health and decisions. Your health isn’t a game, so get the right help. People that are “high risk” shouldn’t take Betaine HCL without supervision. You’re high risk if you’re consuming any anti-inflammatory medicines. Examples of those are: corticosteroids, aspirin, Indocin, ibuprofen (Motrin, Advil) or other NSAIDs. These drugs can damage the GI lining and supplementing with HCL could aggravate it, increasing the risks of bleeding or ulcer. Warnings aside – you can do this safely and it will help your health tremendously when you correct low stomach acid levels. Did you know your stomach wall is about 5mm thick? And did you know the stomach is built with ridges on the inside that act like a rock crusher as it pulverizes your food? Your stomach can easily handle extreme acid levels. If this acid got out of the stomach it could burn right through every other cell in the body. Our stomachs were built to create and contain acid and making short work of what we eat. Supplementing with Betaine HCL will help it work like it was designed, because every meal you eat with low acid it has to work harder than it should. Each person will have a specific supplementary HCL dosage. Unfortunately, there isn’t a special formula I can give you to figure it out. This is a case of trial and error until you get to the correct dosage. Failing to get to your correct dosage can remove the benefits of supplementing. You must find the right dosage for you situation. If you fail to do the trial and error you’re wasting your time and money. Remember, the stomach is purposely built to handle extreme acid environments. If your correct dosage is 2400mg and you’re only taking 1200mg, you’re not really doing your stomach any favors. You must follow the process below to figure out the right dosage to get the maximum benefit. Eat a meal that contains at least 15-20g of protein (about 4-6 ounces of meat). Start by taking 1 pill of Betaine HCL during the beginning of the meal. Finish the meal as normal and observe your body for any changes in feeling associated with the stomach and belly button area. Look for: heaviness, hotness, burning, or other GI distress. When you experience the GI discomfort finding your correct dosage, you can mix ½ teaspoon of baking soda in 8oz of water and drink it to help lessen the pain. Dr. Wright notes in his book that “paradoxically adverse symptoms are most likely to occur in individuals with the lowest levels of stomach acid. This is because these people are most likely to have atrophic gastritis (a thinned-out stomach lining), which makes them much more sensitive to even small quantities of HCL than a normal, thicker stomach lining.” This makes sense because a super inflamed stomach lining won’t have its normal protective barrier intact to contain the strong acids. In this case, it is wise to start with digestive bitters or get smaller dose Betaine HCL pills (think 350mg or less). If you have low stomach acid and you can’t supplement with Betaine HCL, there’s a few natural methods to help with symptoms. Start by taking a shot of lemon juice or vinegar before a meal to help the symptoms of indigestion. But know that these don’t actually help the digestion of food only the symptoms. A supplement that can help the digestion is digestive bitters. Is this a very high dose of Betaine HCL? It’s very common for people to stop short of their needed Betaine HCL dosage. In fact, in the beginning I was nervous about taking 6 pills at a meal. But trust me. there is nothing to worry about. Dr. Wright reports that the common Betaine HCL dosage range in his clinical practice is 3,250-4,550mg per meal. That means there are also plenty of people who need above 5,000mg for an effective dosage. Remember, a normal functioning stomach is capable of producing and handling extreme acid ranges. If your dosage starts getting extremely high without any GI distress (step #3), you must use your GI symptoms as a guide instead. These include burping, bloating, farting, and stool consistency. Keep everything else the same in your diet as you wait for these indicators to change for the better. Just because you can take 20 pills, doesn’t mean you should. It could be that at 11 pills all of your problems disappear. For this group of people try to find the minimum dose needed to help your GI symptoms and get more testing to figure out what is going on! Ingredients: Betaine hydrochloride, capsule shell (gelatine), microcrystalline cellulose, pepsin. Take 1 - 2 tablets daily, or take as directed by your healthcare practitioner. DO NOT TAKE IF PEPTIC ULCERS ARE PRESENT OR SUSPECTED. DO NOT BREAK CAPSULE BEFORE SWALLOWING, THE CONTENT MAY DAMAGE TOOTH ENAMEL. Capsule Size: 355mg (Betaine 45mg / Pepsin10mg.